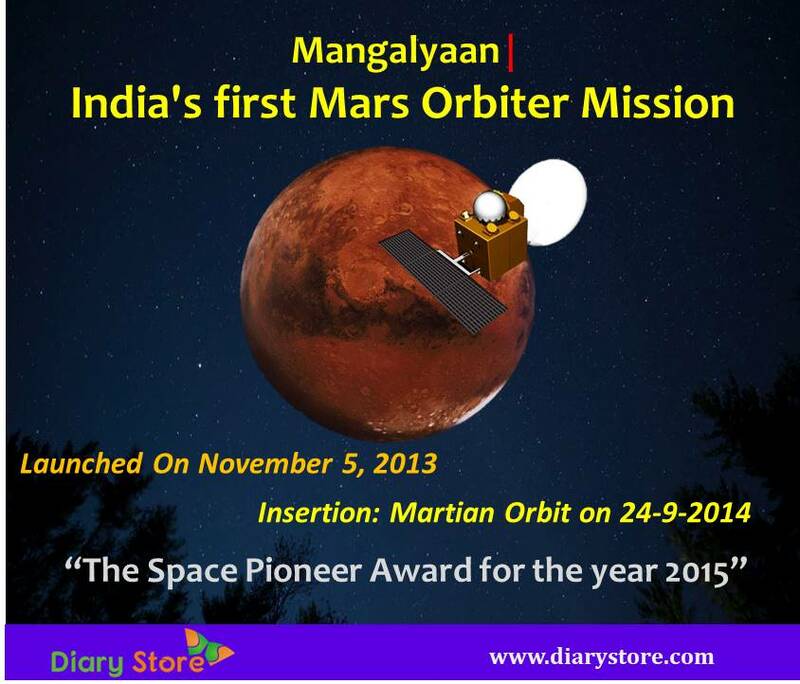 Mangalyaan - The planet Mars has been a special matter of interest for humans for many reasons. In addition to its proximity to the earth after Venus, the geographical terrestrial semblance of Mars seemed similar to that of the earth keeping the interest alive to make innumerable probes about the planet. Mars has a special characteristic red colour which is found out to be due to the presence of iron oxide in its soil, earning the sobriquet “Red Planet”. Because of its red colour, the planet is specifically distinguishable among the plethora of other celestial bodies even when observed with a naked eye from the earth in a dark night sky. Sky gazers were nudged intuitively by the red colour of the planet to name it after the Roman God of war. Several attempts were made by space scientists across the globe to study Mars, about its geology, presence of water and life-sustaining environment, possibility for human habitation etc. Out of 55 endeavours by different nations/agencies, till Dec 2017, seventeen missions were successful; two land rovers are actively roaming on the surface of the planet carrying out specific instructions and six orbiters (with Indian spacecraft Mangalyaan as one of them) are revolving around the planet performing the duties entrusted to them. With the crucial information provided by the currently active rovers and orbiters, plans have already been drafted for sending into space three more rovers (landers), one by ESA (European Space Agency) and two by NASA (National Aeronautics and Space Administration) equipped with more sophisticated payloads. India has made its first ever attempt to ensconce in the realm of Mars by launching its spacecraft called Mangalyaan - which means “Vehicle to Mars”. The spacecraft which is also known as MOM (Mars Orbiter Mission) has been launched successfully and after completion of more than four years of its launch, it is still going strong as against its initial intended mission of mere six months. With the victorious launch of Mangalyaan or MOM, has become the fourth nation in the world, after Soviet Space Programme, NASA and ESA and the first in Asia to go as close to the red planet, by nestling its satellite in the close propinquity of Mars. The primary function of LAP is to determine the relative occurrence of deuterium with respect to hydrogen. It strives to find out the ratio of deuterium to hydrogen which enables scientists to estimate loss of water to outer space because LAP operates at a distance of 3000 kms before and after reaching the nearest point in its orbit called periapsis. (The equivalent word for the nearest point on the orbit around the Earth is perigee). Apart from estimating D/H ratio i..e, deuterium:hydrogen, it also seeks to find out the escape flux of hydrogen corona and generate the hydrogen and deuterium coronal profiles. The Methane Sensor for Mars (MSM) measures the quantity of methane present in the atmosphere of Mars with parts per billion (ppb) accuracy. It collects data from the illuminated regions of Mars because the sensor is capable of measuring reflected solar radiation. The other payload MENCA is devoted for the particle environment studies while the payloads TIS and MCC are meant for mapping surface composition, surface imaging studies and mineralogy of Mars. The launch of Mangalyaan took place on November 5, 2013 by PSLV-XL rocket C-25 from Satish Dhawan Space Centre at SHAR, Sriharikota, Andhra Pradesh, India. The MOM had to spend about a month in the earth’s orbit where a series of seven apogee-raising manoeuvres were conducted before its trans-Mars injection on 30-11-2013. 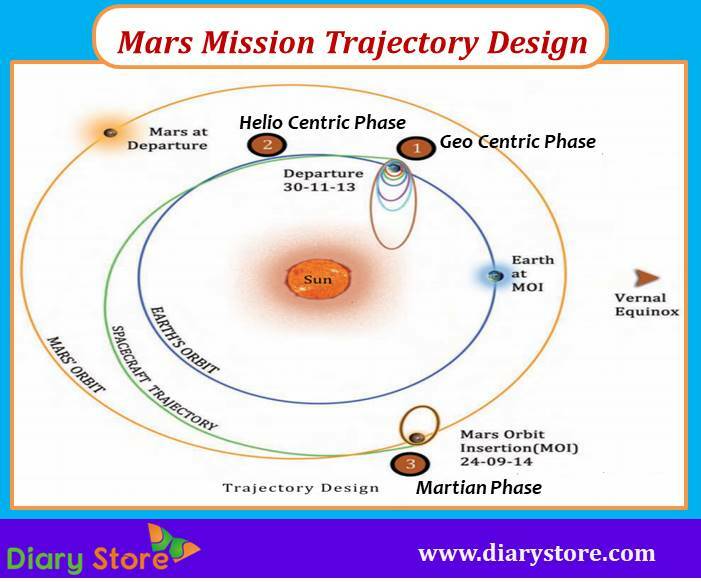 After a 298-day journey to Mars, the successful insertion took place into Martian Orbit on 24-9-2014. When the MOM was launched on 5.11.2013, it reached an apogee of 23,550 kms. The first orbit-raising manoeuvre was done on 6.11.2013 when its apogee was raised to 28,825 kms. The series of such orbit-raising manoeuvres (ORMs) continued thereon, with the next ORM increasing the apogee to 40,186,kms on 7.11.2013, 71,636 kms on 8.11.2013, 78,276 kms on 10.11.2013, 1,18,642 kms on 12.11.2013 and finally to 1,92,874 kms on 15.11.2013. On 30.11.2013, the MOM was successfully inserted into heliocentric path by trans-Mars injection. The satellite reached the second major stage of being deployed into Hohmann Transfer Orbit on 11.12.2013. The great moment of final insertion of MOM into Martian Orbit arrived on September 24, 2014. Instead of direct launch of satellite into Mars orbit, India chose to sending MOM via Hohmann Transfer Orbit in an energy saving endeavour. 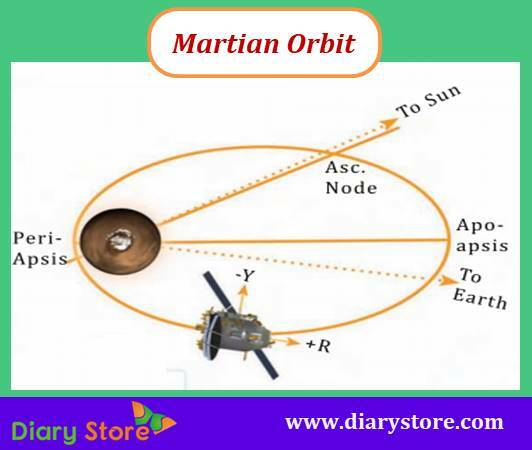 The MOM was initially put in the Mars orbit which is highly elliptical around Mars with a revolution period of 72 hours, 51 minutes and 51 seconds, a periapsis of 421.7 kms and an apoapsis of 76,993 kms. At the end of inserting into the final intended orbit, the MOM was left with substantial amount of fuel on board, several times more than necessary for its originally conceived mission. The first view of Mars captured by one of its payloads MCC, Mars Colour Camera, was published on 28.9.2014. 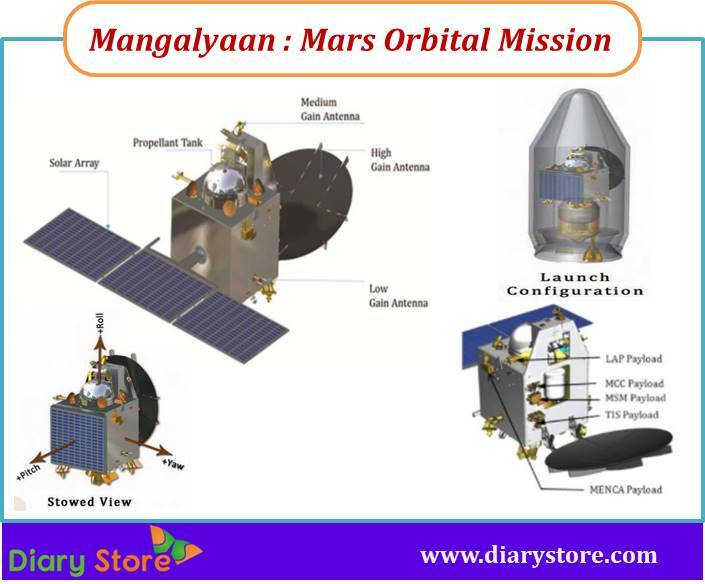 Mangalyaan completed successfully six months on 24.3.2015 in Martian orbit with still plenty of fuel on board sufficient to keep it dynamic and active for many more upcoming years, as against the originally conceived mission of only six months. From the wealth of information acquired from MOM, ISRO published on 24.9.2015 its “Mars Atlas”, a scientific trove of 120 pages with images and data obtained during the first year tenure of Mangalyaan around Mars. The payload MENCA (Mars Exospheric Neutral Composition Analysis) meant for particle environmental studies sent the details of measurements, being the first science results of the mission, were published in Geographical Research letters in March 2016. Mangalyaan has successfully completed 1000 days (973 Martian days called sols) on 19.5.2017. Within first 1000 days its mission, the spacecraft finished 388 revolutions around Mars and sent more than 715 images back to ISRO. Another payload MCC (Mars Colour Camera with its high resolution) of Mangalyaan transmitted spectacular full-disk colour imagery of Mars, which is a very rare feat which helps immensely space scientists in their further research. The National Space Society, USA gave the Space Pioneer Award for the year 2015 in the category of Science and Energy for the successful launch in the very first attempt and obtaining a full-disk colour imagery of Mars though the spacecraft was in an elliptical orbit with a very high apoapsis, which was a very rare feat in itself. India took pride in printing the image of Mangalyaan on the reverse façade of the currency note of Indian Rupees (INR).2000 denomination. Mangalyaan has been hailed as the most inexpensive project ever undertaken which cost India US$73 million (~Rs.450 crores). This is much cheaper than an 8-lane bridge in a metro city like Mumbai in India which cost US$340 million. It is less than the film-making of “Gravity” which cost the producer a whopping US$ 105 million. The project cost of Mangalyaan is calculated to be one-tenth of what NASA expended on the American counterpart MAVEN. Mangalyaan is the first ever spacecraft of India to be launched outside the Earth’s sphere of influence by ISRO in its entire history of 44 years. India has proudly announced that Mangalyaan was manufactured within a span of 15 months whereas NASA took about half a decade to make MAVEN ready for the launch. The scientific data being sent by MOM frequently is throwing more light on the realistic status of the red planet and its surroundings. With the gradual advancement in the clearance of fundamental ambiguities, Mangalyaan is revamping the techniques of launching and operating the ensuing satellites. The informative data acquired through MOM is immensely useful for the forthcoming projects and enables to send more sophisticated payloads for better comprehension of the planet including presence of water essential for sustenance of life, possibility for human habitation, agricultural cultivation as contemplated by Space-X, a US-based private astronomical organization. Encouraged by the remarkable success of Mangalyaan, ISRO is setting its sight on launching Mangalyaan 2.0, advanced version of its predecessor equipped with the next-generation payloads. The proposal for Mangalyaan 2.0 was approved by the Government of India in its budget 2018-19. In addition to this, it is most likely that an Indian lander/rover will touch down the Martian surface in 2021-2022. The ever-increasing pitch for probing the red planet is manifesting itself in the proposed launches of rovers/landers by international scientific communities. Exo Mars Rover of ESA is planned to launch in 2018. The rover will be delivered to the surface of Mars by a proton rocket, after a nine-month journey. The Exo Mars Rover will dig the Martian soil using a mechanical drill to analyse the sample and it roams about on the surface to search for evidence of life. Insight is a lander slated to be launched by NASA in May 2018 which is flanked by seismometer and heat flow probe and aims at precision tracking. Its objective is to explore the deep interiors of Mars and enhance our comprehension about the formation of terrestrial planets. Mars 2020 is another rover of NASA, largely akin to its predecessor Curiosity, has its mission focused on astro-biology, to scan more closely the surface geology and estimate the potential for preservation of bio signatures, the past and present habitability. It is planned to be launched in July 2020.